Royal Enfield Classic 350 Standard gets rear disc brake. However, it does not get ABS in this update, while the Classic 350 Signals gets ABS. The standard version is now priced at Rs 1.47 Lakhs. It all started with the launch of Royal Enfield Classic Signals 350. The Limited edition RE bikes were a tribute to the Indian Army and Air Force. Now, Signals 350 was the first RE bike in India to feature a dual-channel ABS feature. After that, the Himalayan and Classic 500 received dual-channel ABS features. Now, the Classic 350 has been introduced with a rear disc brake, but sadly without ABS feature. However, dealer sources reveal that the ABS variant will launch soon. The Classic 350 Rear disc brake variant has been priced at Rs 1.47 Lakhs and is now available in all variants. Earlier, only the top-end Gunmetal Grey came with a rear disc brake. The STD variant came only with a single disc brake. Amongst these 4, only Classic Signals 350 gets dual-channel ABS. The rest of the lineup is yet to get the safety feature. 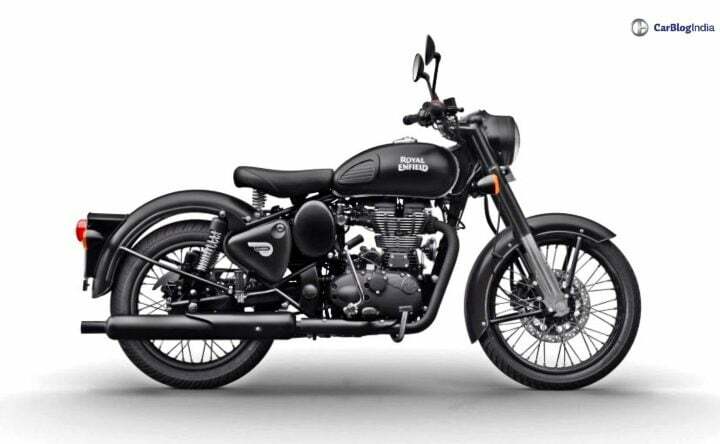 At the launch of Classic Signals 350, Royal Enfield confirmed that the rest of the bikes will also receive ABS this year. So, till now, Himalayan and Classic 500 get ABS. The Thunderbird series and the Classic 350 series are yet to get dual-channel ABS. The Royal Enfield Classic 350 comes with a 346cc air-cooled engine. The TwinSpark engine gives out 19.8 BHP of max. power and 28 Nm of peak torque. The engine comes mated to a 5-speed wet multi-plate clutch. The mileage estimated on this bike is around 27 kmpl. Currently, Royal Enfield is all geared up for the launch of their iconic 650 twins. The Interceptor 650 and Continental GT 650 are all prepped to launch globally tomorrow. The launch is taking in the USA. Various media reports speculate the launch to be around Diwali 2018. The Interceptor might cost around Rs 3 Lakhs and the Continental GT might retail around Rs 3.5 Lakhs. We have the official photos, specifications, and features of the 650 twins. The wait is just for the prices of both the bikes.